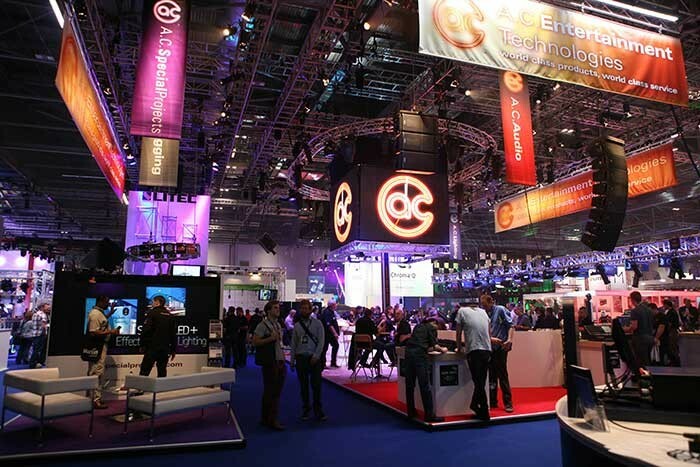 A.C. Entertainment Technologies (AC-ET) Ltd received a great reception to cutting-edge new technologies showcased on their stand at PLASA London 2013 from the many brands the company distributes exclusively in the UK and certain international territories. This year's show was the biggest and best yet for AC-ET. Key lighting, video, rigging and audio product innovations were represented from AC-ET's portfolio of over 200 premium brands and four specialist sales divisions. There was a great reception to the worldwide launch of the new Vision LED family, which features a 16° Par, a 1 metre batten and a zoomable moving wash each using 10W RGBW Multichip LEDs and delivering powerful and consistent performance. The LED range offers real value for money without compromising on performance, build quality or reliability, and provided dynamic illumination of the industry-sponsored BTCC racing car driven by Jack Goff - who ended his debut season in the 2013 Dunlop MSA British Touring Car Championship last weekend at Brands Hatch with a 2nd place podium finish in the final race. Visit the AC-ET website for full details on the Vision range. Other LED product highlights included PixelRange's PixelLine4 next generation wash fixture, Spotlight's new FollowLED 250 RGBW high efficiency colour-changing followspot, and SGM's X-5 / X-C5 powerful yet efficient strobes. On Chroma-Q's dedicated stand next door, LED innovations showcased included the award-winning Inspire RGBW colour-mixing house light, new battery powered version of the award-winning Studio Force V 12 Phosphor variable white softlight, the Color Block 2 Plus Nano single cell discreet lighting system and Auto LED II automated moving yoke showing off its purpose design for tradeshow stand lighting. The Color Force RGBW and Studio Force White lighting ranges were featured illuminating a large cyc backdrop, to demonstrate their meticulous colour accuracy and consistency, and precise theatrical grade dimming. Jands highlights on the AC-ET stand included the new Vista D1 playback processor for the award-winning Vista range of lighting and media control solutions, and the multi-award-winning Stage CL console specifically designed for controlling LED fixtures. Other lighting highlights included James Thomas Engineering's new retro-designed PATT 2013 softlight, High End Systems' Hog 4 console range, the latest models from Philips Selecon and Mole Richardson and a selection of professional lighting support and grip solutions from the expansive Manfrotto and Avenger range. The video area of the stand drew crowds for its unique, dynamic demonstration of 3D projection mapping controlled by several Green Hippo media servers, with content being projected onto a scale model of the Jack Goff racing car via four overhead Christie digital projectors. The video content included the full industry-sponsors car livery and various other designs. The centre-piece of the stand was a huge LedGo high resolution cubed LED video wall flown over the bar area showcasing a mixture of eye-catching footage and brand logos. On the rigging side, highlights included live demonstrations of the Kinesys DigiHoist programmable digital hoist system running the latest Vector software to control various CM Lodestar chain hoists, and a BroadWeigh full load monitoring system actively monitoring the mother grid over the AC-ET stand. Other products featured included VMB's new HDT-8 heavy-duty tower lift and a large display of the latest Litec trussing range and the Prolyte StageDex versatile staging system. Audio brands represented included the latest digital mixing console offerings from Soundcraft, Yamaha and Allen & Heath, as well as active line array and loudspeaker solutions from RCF and Nexo. Finally, the stand included demos of the company's Cable Express in-house custom manufacturing service - just one of the many value added services available as well as AC-ET's other Gel and Lamp Express services, emergency out of hours backup, and used, clearance & eBay sales. AC-ET's UK sales director, Jonathan Walters, commented: "We're absolutely thrilled with the reception AC-ET received at this year's PLASA London show. Staff had many encouraging comments from customers and manufacturers about our stand format and its presentation of products. With a number of exciting innovations launched exclusively on the stand, there was a real buzz and much interest throughout the show. 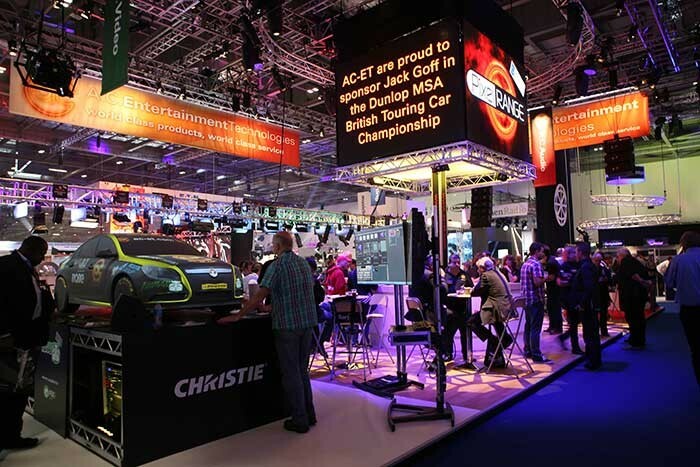 Application demos of technologies such as 3D projection onto the Jack Goff racing car really unlocked visitors' imagination to some of the creative possibilities the latest generation of entertainment technologies we supply can deliver." AC-ET will be exhibiting at the Broadcast Video Expo (BVE) North 2013 Show, Manchester Central, on 12th - 13th November.